It’s a fact: South Dakota thrives on farmers and ranchers. South Dakota food producers feed our families, support our businesses, enliven our communities, and take part in a noble heritage. Another two facts: many ranchers and farmers are retiring, and it will take a new wave of farmers and ranchers to carry this legacy forward. Family agriculture is of significant value to South Dakota, and we need significant funds if we are going to keep family farming and ranching in South Dakota. 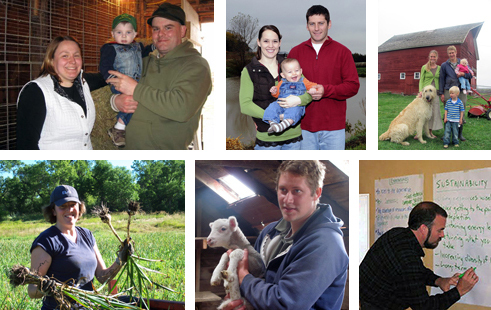 Will you consider giving a donation to support family scholarships for the next Farm Beginnings class? Farm Beginnings® is a farmer and rancher led training program offered by Dakota Rural Action that helps give participants the tools to launch a profitable, sustainable farming business. Nowadays, starting out in agriculture can be particularly difficult, even impossible, without the right training. That’s why Dakota Rural Action launched the Farm Beginnings® training program. This fall will be the program’s fifth year and the first year the class is being held West River. Farm Beginnings students learn directly from skilled farmers and ranchers essential farm business skills such as whole farm planning, financial planning, marketing, and connecting with mentors and resources. Besides classroom training, families get how-to experience from tours and workshops. Over the last four years, 34 families have completed the Farm Beginnings® program, with over 80% of those graduates engaged in farming activities since completing the class. Grassroots fundraising during that time not only helped cover costs of the overall course, but also provided over $22,000 in scholarships to 26 families. This money has come directly as gifts from folks like yourself. Your gift meets an immediate need and supports a way of life. Farm Beginnings course tuition is $1500 per family and we hope to offer need-based scholarships for up to half the course cost, or $750 per family. Our goal is raise enough funds for our scholarships. Donors so far have given a little over $1500, and this will provide 2 of those 7 scholarships. Please help 5 more farming and ranching families get started this year. Donate. Scholarships provide a great giving opportunity where money from South Dakotans helps other South Dakotans. It speaks of faith in the values of family farms and ranches and in the people who will devote their labor to these livelihoods. This is an opportunity for all of us who want to see family agriculture remain viable in South Dakota to invest in the next generation of farmers and ranchers. Thank you for your time and making this grassroots organization viable. And, thank you for considering donating as much as you can to scholarships for new farmers and ranchers. All gifts to Dakota Rural Action are tax-deductible. Donate to Launch Next Wave of South Dakota Farmers + Ranchers.